The IALF Certificate in Content & Language Integrated Learning (C-CLIL) is for teachers or lecturers who have to teach subject content (e.g. maths, economics, international law, history) in English. The current trend of the internationalization of education, which involves content such as maths or science being taught in a foreign language, brings many challenges for both content teachers and lecturers and for English teachers here in Indonesia. IALF Bali has many years of experience training school teachers and university lecturers, both at our Bali centre and on-site. We offer both a 4-week course and 1-week modules, which can be taken separately to fit into semester and holiday schedules. It is possible to sit the Cambridge English Teaching Knowledge Test (TKT) CLIL examination, at the end of the 4-week course, or after four or five 1-week modules. This gives participants an international qualification in CLIL. The C-CLIL combines teaching the subject with teaching English. An alternative is the IALF C-TEMI (Certificate in Teaching using English as a Medium of Instruction), which has no explicit language instruction. Who is the C-CLIL for? The CLIL course is open to institutions and interested groups. 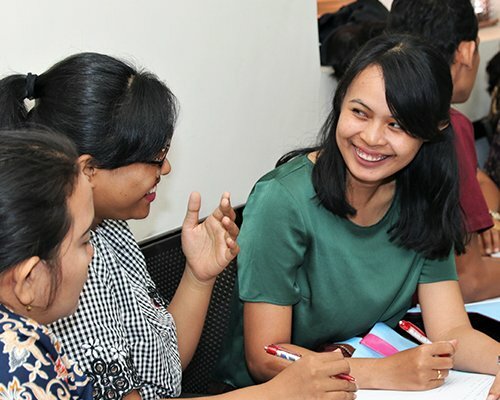 However, if you would like an introduction to the subject, we offer a CLIL Teacher Training Workshop at our Bali centre. For further information about the C-CLIL or the workshop, please call us on +62 361 225 243 or contact us.